If you’ve ever tried one of those boba tea / bubble tea drinks at an Asian café and now you’d like to make it at home, then you’ve come to the right place. If you have no idea how to prepare one of those drinks, then sit down and stay a while. I will walk you through the steps on how to cook the tapioca pearls (those balls at the bottom of the drink) and then how to flavor the drink to get an authentic and delicious final product. If you’ve searched the web looking for information on preparing a bubble tea drink, then you will have realized that there are many different ways of preparing this drink. I will share what worked for me. First, you must purchase the raw tapioca pearls that go at the bottom of the drink. If you have a local Asian market, then you should be able to find a number of different varieties of tapioca pearls there. Alternatively, you can order them online here or here . Now let’s get to the process of cooking the boba. Fill a pot with 2 cups of water. Bring to a boil. Add 1/4 cup of tapioca pearls into the pot. Stir until they float to the top of the water. Lower the heat and cook the boba for 15-20 minutes. Remove the pot from heat, cover and let sit for about 15 minutes. Prepare a sugar syrup- combine 1/4 cup water and 1/4 cup sugar in a saucepan and heat until the sugar is completely dissolved. Let cool. Prepare a cup of tea. Steep one (or two, for stronger flavor) tea bag in a cup of hot water for 10 minutes. Let cool. Drain the boba from the water. Pour the sugar syrup on top of the boba to preserve the boba. To prepare the boba drink, pour the tea into a glass and add the cooked tapioca pearls. Sweeten by adding some of the simple syrup. 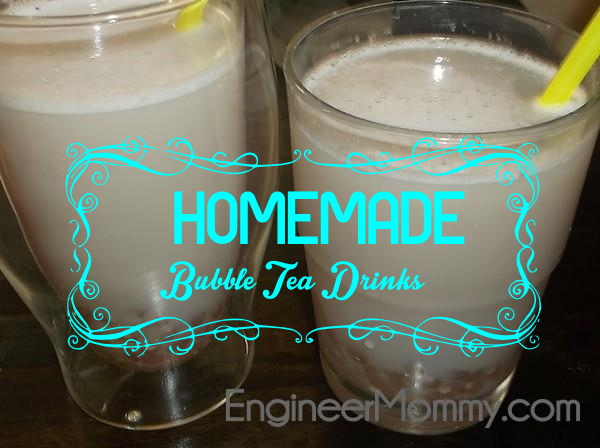 I like to add milk to make a creamy bubble tea – you could add some sweetened condensed milk for a rich final product. Alternatively, you could add some juice for a refreshing, fruity tea. Enjoy your bubble tea drink – Bon Appetit! I love boba tea! I’m not kidding, I was just thinking this morning that I wish I could figure out how to make it myself, and then I found this on the Weekend Re-treat party. Yay! Thank you! Yay! I’m glad you found this useful!